Once discarded as a niche-messaging app, Snapchat is a rising content platform your brand shouldn’t ignore—especially if you’re marketing to millennials. Today, more than 60 percent of Americans between the ages of 13 and 38 are Snapchat users. That active audience is hungry for unique content and engagement: Snapchat’s usage rates rival Facebook and have surpassed Twitter. Based in New York City, charity: water’s mission is to provide clean and safe drinking water to more than 660 million people in developing countries. Since 2006, the nonprofit has funded nearly 20,000 water projects in 24 countries. 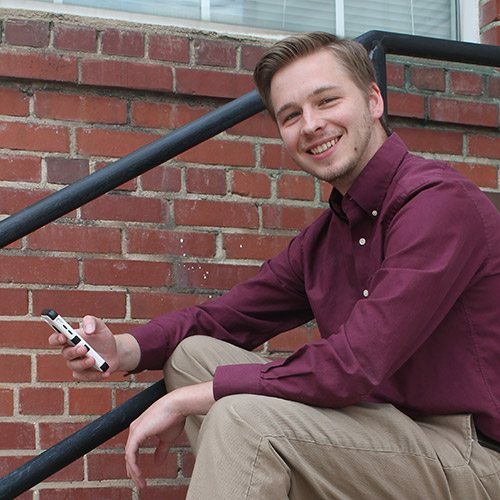 The organization first started using Snapchat to tell its story in February 2015. 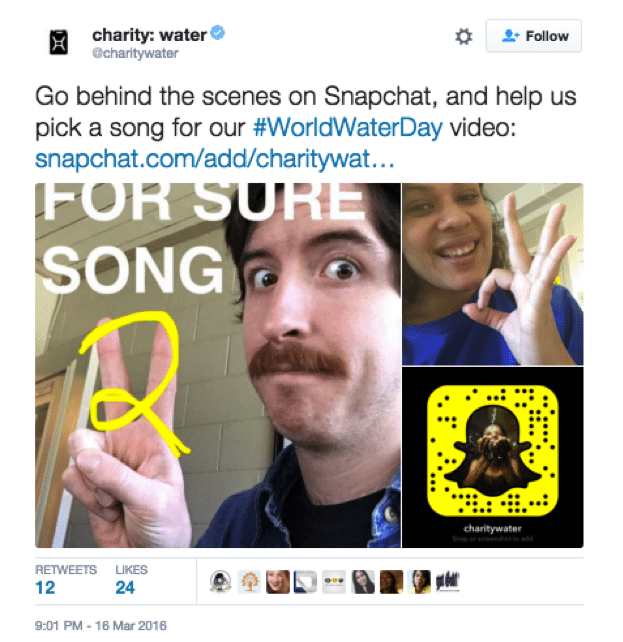 What are the broad goals for charity: water’s social media content and how critical are those channels to spreading the organization’s message? We think about our social channels as creating daily moments of inspiration, connecting people to the impact of the work in the field and the community of people that help make that possible. We look at them as a place to inspire people with the love of generosity, loyalty and advocacy through the power of stories. 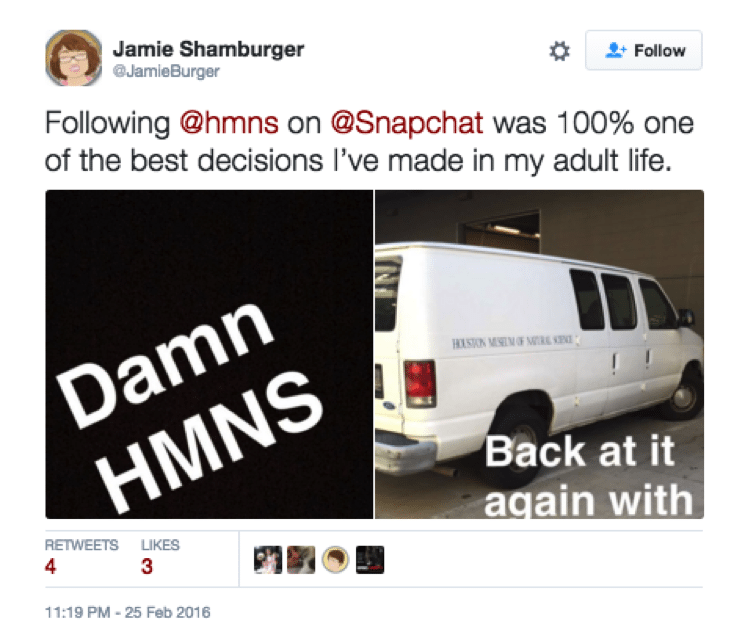 How do you leverage Snapchat as a platform to communicate your message? We think fundraising should be fun. We think giving should be the best transaction that you ever make. And that’s the thing about social media: People are there to have fun. Especially on Snapchat. We just launched a big campaign where we brought our Snapchat community behind the scenes of the creation of a new video. And they got to be a part of the process: We let our Snapchat community pick the song that we used in the campaign video. 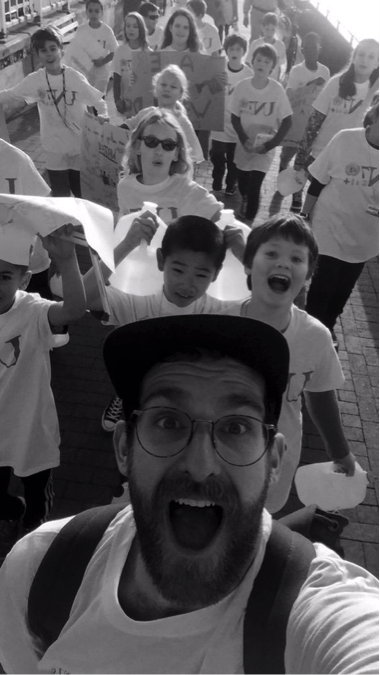 We also like to use Snapchat to tell the story of our campaigners who make our work possible. Every year, a group of people in Boston does a Polar Plunge. In the middle of February, they strip down to their shorts and t-shirts and run into the freezing-cold ocean to raise money for charity: water. I went up there with a buddy and we Snapchatted the experience of our campaigners doing something really, really crazy for something they believe in. The charity: water brand is a mix of voices from your team and those who are impacted around the world. On a channel like Snapchat, how do you balance fun with an appropriate level of seriousness? We never want to guilt people into giving; we want to inspire people to be a part of making a difference. That’s through positive storytelling and showing the impact that $30 can have on the life of somebody on the other side of the world. If you look at our photos and videos, we don’t position people from a place of poverty; we position them in a place of power and the empowerment that water can bring to their lives. What is your top piece of advice for organizations starting to use Snapchat? The number one thing is: Be true and be authentic in your excitement for things. 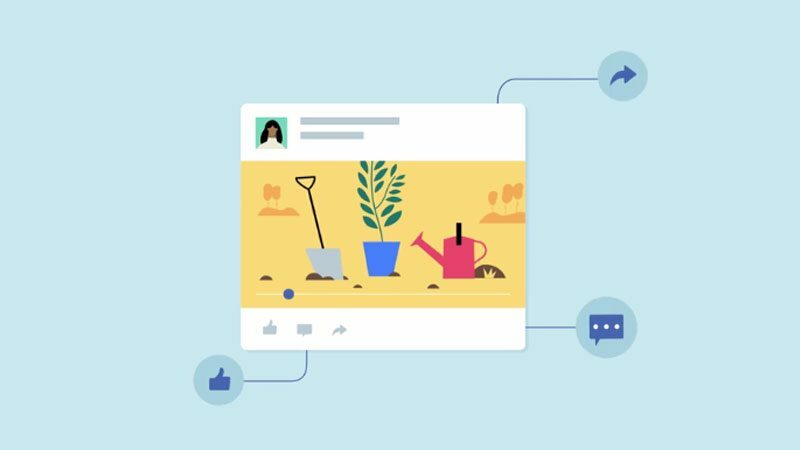 People are not on the internet to connect with your brand. The allure of brands alone doesn’t motivate you to download the app; it’s your friends and family. You typically [join] because it looks like fun. That’s the kind of thing you want people saying about your brand. The majority of our followers on these channels are younger and more likely to be active ‘Snapchatters.’ That’s an audience we’re trying to engage with, since we already have [reached] the older crowds. At the event, we relied on word-of-mouth promotion. 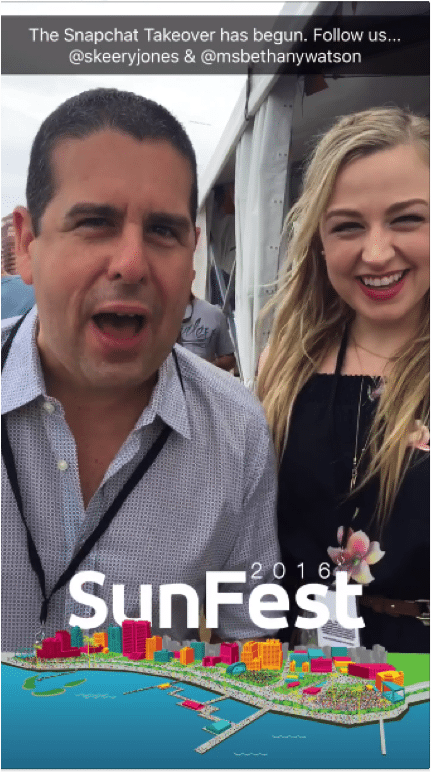 During the festival, we hosted a takeover of our Snapchat account with national radio personalities Skeery Jones and Bethany Watson. This allowed us to entice a new, but similar audience by appealing to their existing followers. I met up with their teams and had them use my phone to do the takeover. We did find, unfortunately, that only one person can be logged into a Snapchat account and we didn’t want to kick them out of their personal accounts. So we had three phones going. It was kind of a Snapchat Inception. 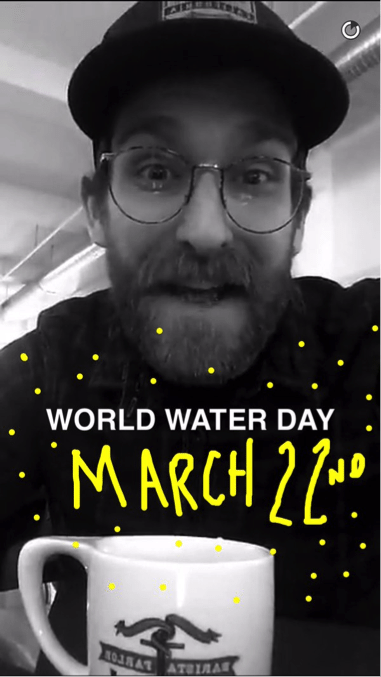 Snapchat recently opened up its coveted geofilter for business or personal use. You can pinpoint the geographic area and the time, which determines the cost. The cheapest you can do is $5 and the prices go up from there. 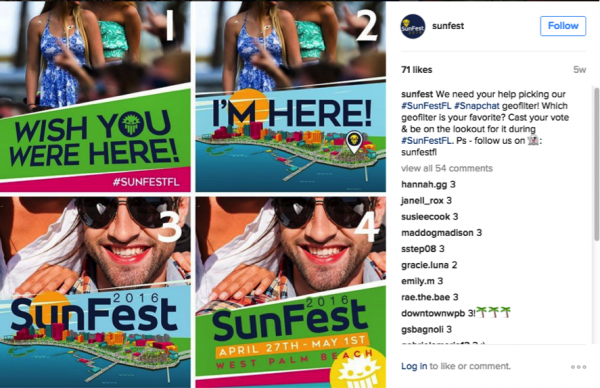 Geofilters can be active for up to 30 days. Our designers created four different geofilters and we let our Instagram community vote on the filter we would use. It’s great for brand awareness as we saw people posting stories to their Snapchat with our filter. The Houston Museum of Natural Science (HMNS) is one of the most popular museums in the United States, averaging more than 2 million visitors each year. 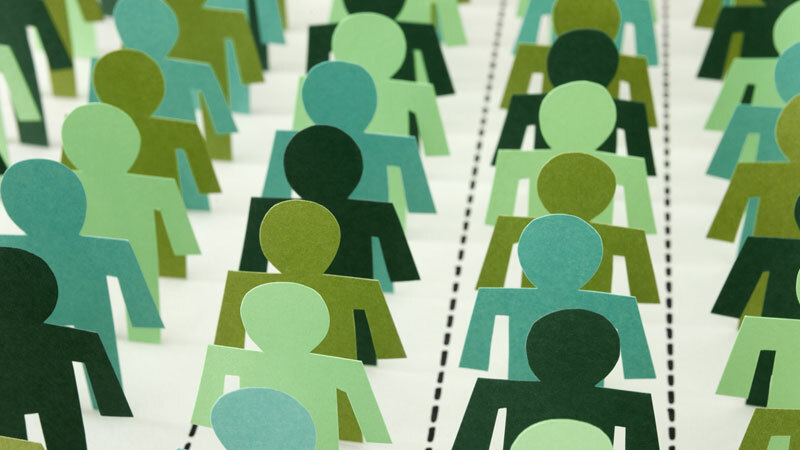 The museum is a major social media influencer too: Huffington Post named it one of 10 Museum Tweeters To Know Right Now. How do you use Snapchat differently than other content channels to engage your audience? The demographic of Snapchat users is skewed younger than other social media channels, with the majority of users being 25 and under. Also, the culture of Snapchat tends to be more informal and radical, possibly [because] the content is temporary. So we tend to post content that is related to pop culture with a science spin—i.e., creating stories of top 40 songs using objects from around the museum, or creating our own version of “Damn Daniel”—and post more playful content. Tell me about a successful series you ran on Snapchat. We have a monthly series where a museum employee takes over our Snapchat account for the day. We started this series at the beginning of this year and have had our entomologist, museum store buyer, HMNS educators and others do a takeover. There’s such a wide range of jobs at a museum, so every takeover is drastically different. We’ve gotten some great feedback on this series. 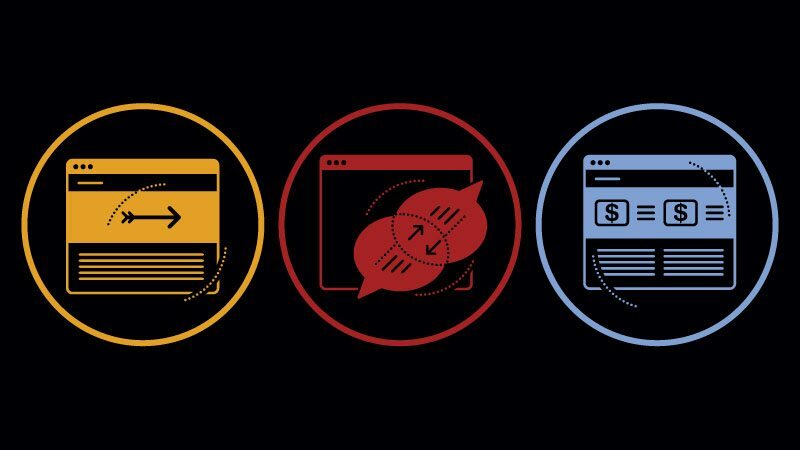 How do you measure success metrics and ROI? Measuring success on Snapchat is tricky because at this time, Snapchat doesn’t provide you with analytics like other social media channels do. To measure our user behavior, reach, growth, etc., on Snapchat requires manually reporting. We have a spreadsheet that we update regularly that holds all this data. How do you balance entertainment, promotion and education on a channel primarily used for peer-to-peer entertainment? Education is the core of what we do here at HMNS and that is reflected through all of our online media. When promoting events or educational lessons on Snapchat, I always try to add a humorous note to the story. For example, when promoting a showing of The Princess Bride, I add in snaps of movie quotes prior to announcing the event. It’s easy for users to tap through a story without looking at it, so grabbing their attention from the start is key. Poshmark is a digital marketplace (and app) where users can share outfits as well as buy and sell used clothing. In April, Poshmark’s CEO estimated that “one in 50 women in America have opened a shop” on the site. When did you start using Snapchat and how has your strategy changed since? We initially started using Snapchat in 2013 when it was just starting to gain traction before Stories were even a thing (crazy, we know!). In the beginning we were just trying to figure out the best way to use the platform. Now Snapchat is one of our main channels to connect with our community. Today we use Snapchat to remove the barriers between Poshmark and our community, providing insider access by consistently sharing tips on using Poshmark, sneak peeks at upcoming product features, rapid-fire questions with our CEO, community member takeovers and even funny Friday dance parties at the office. We’ve found that our community responds best when they can connect with an actual human, so I’ve become the face of Poshmark on Snapchat. It’s been successful having a relatable, recognizable face to represent the company. What’s been your favorite campaign on Snapchat? There are so many. One of our community’s favorite recurring series is our Tuesday Shoesdays where we feature the fabulous footwear styles from around the office. One of my all-time favorites was a campaign we did to celebrate Poshmark’s 4th birthday where we invited members from the Poshmark community and Team Posh to all login and record a Snapchat video wishing Poshmark a Happy Birthday; everyone was so creative and had a ton of fun with it. What’s the best advice you can give about using Snapchat? If you’re going to dive into Snapchat, it’s important that you really dive in. We not only post to our story, but we always respond to direct messages, screenshot our community’s photos, share on other social media channels and are always participating in conversations. On any social channel it’s important that if you start a conversation, you participate in it too. The key to Snapchat is to be genuine, and if you can creatively share your brand’s story in just 10 seconds (…and maybe with a fun filter), you’re golden! What brands do you love on Snapchat? Share your favorites with us in the comment section below.